The global lightweight materials market in terms of value is estimated to witness a growth at a CAGR of 7.0% between 2017 and 2023. The increasing demand and the growth rate for lightweight materials in the market is attributed to their increasing usage in end-use industries such as automotive, aerospace & defense, wind energy and others. The rising demand is in line with the unique properties of lightweight materials. The properties such as low density, high strength and stiffness, high ductility, temperature and corrosion resistance make lightweight materials a preferred choice over conventional materials such as iron and steel. These properties help in weight reduction, leading to increased fuel economy, reduced CO2 emissions and longer life and low maintenance costs. The report is a compilation of various segmentations including market breakdown by lightweight material type, sub-type, end-use applications, and different geographical regions. It also includes sections on competitive insights and market dynamics. Herein the revenue generated from lightweight materials is tracked to calculate the market size. While highlighting the key driving and restraining forces for this market, the report also provides a comprehensive section of the application areas of the lightweight materials market. It also examines the role of the leading market players involved in this market. • What is the global lightweight materials market size is in terms of revenue from 2016-2023? • Which is the dominant type and sub-type by revenue in the lightweight materials market? • What is the revenue generated by the different lightweight materials by type and sub-type in the lightweight materials market? • What is the revenue generated by the different applications of the lightweight materials market? • What are the major factors challenging the growth of global lightweight materials market? • What are opportunities for the global lightweight materials market? • What is the revenue generated by the different geographic regions in the lightweight materials market? • Which region will lead to the global lightweight materials market by the end of the forecast period? • Which are the existing key market players that have made a mark in the lightweight materials market? The report has put special emphasis on the market share and size of metals, composites and plastics, owing to their high share in the current and upcoming market of lightweight materials. The industry analysis have also been undertaken in order to examine the impact of various factors and understand the overall attractiveness of the industry. The most often used strategy for developing a better hold on to the market has been through agreements, collaborations, contracts, and partnerships, followed by new product launches. The company profile section includes highlights of significant information about the key companies involved, along with their financial summaries and key strategies & developmental activities of recent years. Some of the key players involved in this market are Toray Industries, Teijin Limited, Mitsubishi Rayon Co. Ltd., SGL Group, Hexcel Corporation, Cytec Industries, Owens Corning Corporation, Jushi Group Co. Ltd, Dead Sea Magnesium Ltd., Titanium Metals Corporation, Vsmpo-Avisma Corporation, ALCOA Inc., Novelis Inc., Arcelor Mittal S.A., Rio Tinto, China Hongqiao Group, Thyssenkrup AG, Lyondellbasell Industries N.V., Formosa Plastic, and SABIC. Metals dominated the lightweight materials market accounting for a market share of 60% by value in 2016. Asia Pacific generated the maximum amount of revenue in the year 2016 in the global lightweight materials market followed by North America and Europe. Additionally, APAC has the highest potential to grow in the forecast period due to the presence of emerging economies such as China and India. 8.7 Dead Sea Magnesium Ltd.
8.13 Mitsubishi Rayon Co. Ltd.
Lightweight materials are materials which weigh less whilst possessing the same strength as that of heavy materials. Some of the lightweight materials include aluminum, high strength steel, carbon fiber reinforced plastic (CFRP), glass fiber reinforced plastic (GFRP), plastics, magnesium, titanium, and others. Lightweight materials offer various unique properties such as resistance to corrosion, heat, & temperature, high electrical and thermal conductivities, low density, high ductility & strength, lighter weight, increased fuel economy, reduction in CO2 emissions into the atmosphere, and longer service life thereby, reducing the cost of maintenance. These properties are not present in other conventional materials such as steel, copper, nickel, and iron. The lightweight materials market is estimated to reach $242.78 billion by 2023. Increasing usage of lightweight materials in end-use industries, superior properties of lightweight materials over conventional materials, and stringent regulations are some of the major factors which has contributed to the overall market growth. High production cost associated with lightweight materials and uncertainty in production tax credit are two of the major factors hampering the growth of lightweight materials. However, tremendous potential for growth end-use applications, huge investment by government and federal agencies, and growing demand from emerging economies such as China, India, and Brazil is expected to create major opportunities in the lightweight materials market. Lightweight metals segment dominated the global lightweight materials market with a share of approximately 60.0% in the 2016. The lightweight metals cater to the impending demand of a number of application verticals which is the major reason behind their biggest market share. This category is growing at a slow pace because of the shift in the trends of lightweight materials usage towards composites. The widespread application of lightweight materials in automotive accounted for a major share of the global lightweight materials market in 2016. The use of lightweight metals in automotive industry exhibits specific features such as high strength, stiffness, resistance to heat & corrosion, etc., which are not found in the conventional materials. This dominance is expected by the global lightweight materials market due to increase in the stringent regulations and standards by the government regarding reduction in carbon emissions and improvement in fuel efficiency by reducing the weight of the vehicle. Major companies such as BMW, Ford, Apple Inc., General Motors, among others are using lightweight materials in the manufacturing of the parts to reduce the average weight of their vehicle models, thereby increasing the fuel efficiency of the vehicle. Asia-Pacific has the largest market share in the lightweight materials market. The major part of the Asia-Pacific’s major share is contributed by the China, which accounted for more than 50% of the total revenue generated in 2016. This is because of the presence of highly advanced research institutes, academia, multinational industrial corporations, automotive and aerospace and defense manufacturers, and increased wind turbine installations which have been providing the necessary impetus to the Asia-Pacific lightweight materials market. 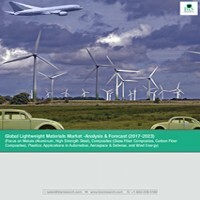 Some of the key players in the lightweight materials market includes Toray Industries Inc., Teijin Limited, Mitsubishi Rayon Co. Ltd., SGL Group, Hexcel Corporation, Cytec Industries, Owens Corning Corporation, Jushi Group Co. Ltd, Dead Sea Magnesium Ltd., Titanium Metals Corporation, Vsmpo-Avisma Corporation, ALCOA Inc., Novelis Inc., Arcelor Mittal S.A., Rio Tinto, China Hongqiao Group, Thyssenkrup AG, Lyondellbasell Industries N.V., Formosa Plastic, and SABIC. These companies are actively aiming for an increased number of agreements, partnerships, collaborations, & contracts and products to expand their operations thereby, enhancing their share in the lightweight materials market.